We returned late last night from an eight-day camping trip in Yosemite National Park. Yosemite is not in New England, I realize, but it was nonetheless a Great Time in the Great Outdoors with Great Kids. This was our second trip in as many years to the park of granite cliffs and glacier-polished domes, waterfalls, and wildflowers. Last year, we visited in August and spent most of our time in the high country around Tuolumne Meadow. At the end of that trip, when we dropped down to the valley, Ursula was disappointed to see that Yosemite Falls was more seepage than falling water. We promised her a return trip when the water level was higher, which is how we found ourselves ricocheting from end-of-school activities late last month straight into our first overnight hiking trip of the year. Not only that, it was the very first trip in which both children carried packs — and group gear in those packs. Our packs are still on the front porch where we dumped them last night, and the laundry room smells like a dusty trail. Our hiking clothes may not be fresh, but my memories are. One I’ll hold onto is the morning that Ursula, her friend Kirsten (who joined us on the trip), and I walked around the base of some cliffs near Yosemite Falls and practiced simple rock-climbing moves. 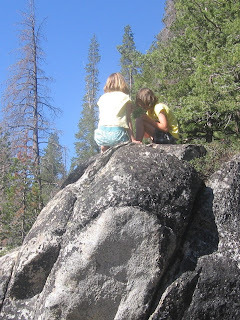 I showed the girls how to balance one foot on a quarter-sized indentation in the rock, known as a “dish” in climbing parlance, how to press in opposing directions to hold themselves in place, and how to hang thumbs-down in a hand crack. We rarely got more than a move or two above the ground, so they also had many opportunities to practice proper spotting technique. That pretty much sums up the trip for us, although this morning Ursula was already climbing the walls. . . .